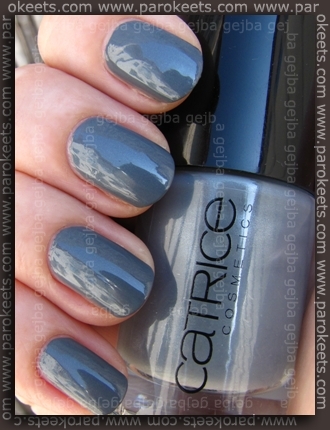 Goga kindly allowed my to make swatch of her Catrice Ultimate Nail Lacquer London’s Weather Forecast (no. 280) polish. I was charmed with this gray shade with multicolored shimmer. … play around with it. This time I used for layering following CND effects: Copper Shimmer, Scarlet Shimmer and Sapphire Sparkle. 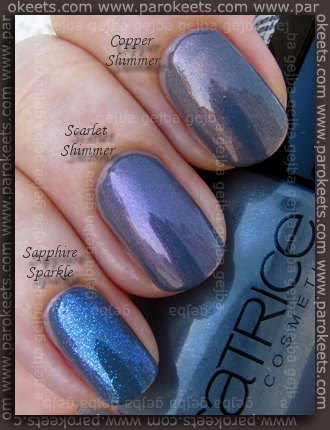 I immediately fell in love with the Catrice London’s Weather Forecast + Scarlet Shimmer combination. Can’t wait to get my bottle of London’s Weather Forecast to play more with it. – 170 I scream Peach! ko sem vidla Mamyjin swatch MAN, GO Tango! sem si zaželela še tistega, ampak že zgornji seznam je čist predolg! Za katere si se ti odločila? Jaz sem ene dobila na TransDesignu druge pa v SN na manikurnem otočku v 1.nad. Ko dobi pa še modrikast podton, je pa sploh :drop: .